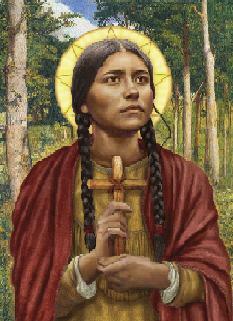 Today is the feast of St. Kateri Tekakwitha, the first Native American saint, whom we New Yorkers claim for our own. Kateri was born in 1656 in what is now Auriesville, New York and died only 24 years later. The daughter of a Mohawk chief and an Algonquin mother, she became an orphan at age four when a smallpox epidemic claimed both her parents and her brother. Her short life was one of generosity and holiness, influenced by Jesuit missionaries and her own deep faith. Today would be a good day to pray in gratitude for the gifts of the natural world and for those who work to protect it. A question to consider in our reflection might include our assessment of ourselves as environmentalists. Do I walk softly on the earth, trying never to disturb the balance of nature? Am I aware of my “carbon footprint” and taking steps to reduce it? Do I recycle and work to keep our waterways pure? The list goes on…How can we be kinder to our Mother Earth, each of us doing our part? May you walk in beauty today. In 2012 Americans – especially Catholics and Native Americans living in upstate New York – celebrated the canonization of two women – one a Franciscan Sister, Marianne Kope, and the other a 17th century Mohawk maiden named Kateri Tekakwitha. 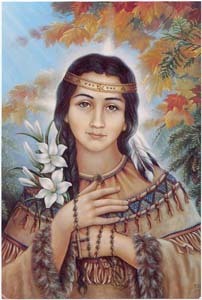 Today is the designated feast day in the Church for Kateri. Today I am grateful for storytellers who have kept the record of Kateri’s life alive until now. She is a model, not only for native peoples but for New Yorkers like me and others who have come to appreciate the wonderful spirituality of Native Americans and to regret the injustices done to them when others came to this land. May the Great Spirit open our hearts to love the land and all creatures and to reverence one another as members of one family.